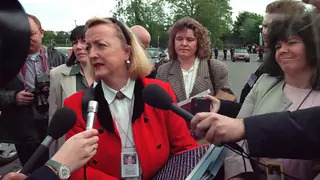 Monica McWilliams and members of the Northern Ireland Women's Coalition speak to the press outside the Stormont Assembly building during the Good Friday Negotiations. Production still from "Wave Goodbye to Dinosaurs"
Voices from the Field features contributions from scholars and practitioners highlighting new research, thinking, and approaches to development challenges. This post is authored by Monica McWilliams, a signatory of the Good Friday Agreement and co-founder of the Northern Ireland Women’s Coalition, with Rebecca Turkington, Assistant Director of the Women and Foreign Policy Program. In “Wave Goodbye to Dinosaurs,” a new documentary about the Northern Ireland Women’s Coalition (NIWC) airing on PBS March 25, former MP Bernadette Devlin McAliskey observes that the NIWC’s role has been largely invisible in retelling the story of the Good Friday Agreement. “Not because women get written out of history,” she concludes; “they never get written in.” Yet the NIWC was a critical player in the Good Friday Talks and made an indelible mark on the final agreement, which ended three decades of violent conflict. In light of the continued exclusion of women from peace processes around the world, their story offers compelling proof that women’s participation can be decisive to negotiation outcomes. Globally, women comprise on average only 8 percent of negotiators, 5 percent of signatories, and 2 percent of mediators of peace talks. A growing body of evidence suggests their presence is correlated with higher likelihood of success, and ultimately longer-lasting peace. One oft-cited study finds that when women participate in drafting, an agreement is 35 percent more likely to last at least 15 years. But simply being present is not necessarily a silver bullet; this aggregate number obscures the creative and courageous ways women use their seat at the table. Women from civil society are often the ones who hammer out difficult solutions to long-term challenges, and bring expertise and negotiating strengths that can shape peace processes and institutions themselves. The strategic approaches that women delegates have contributed time and time again are reflected in the Good Friday Agreement negotiations. When the British and Irish governments decided on the format of the peace talks, they agreed an electoral system that would enable the top ten parties with the most votes to engage in multi-party talks. The system was designed to encourage smaller parties affiliated to the loyalist (armed) groups to enter the process. It involved some ‘political imagining’ for a group of women to build on their pre-existing network of activists and run for election. They co-founded the Northern Ireland Women’s Coalition, representing both sides of the political divide, and six weeks later, the party was successfully elected to the peace talks. Locally and globally, in June 1996, the NIWC became the first women’s party to be elected to peace negotiations. The issues championed by the NIWC were those that addressed long-term social change and reconciliation—not only the proximate causes of conflict. One of their key concerns was participatory democracy, and the Coalition proposed an innovative Civic Forum to advise on social, economic and cultural issues to sit alongside the Legislative Assembly. The NIWC’s focus on social issues resulted in adding language in the final agreement on integrated education and shared housing, as well as community development and work with youth. They broadened the negotiating agenda to include a reconciliation process and victims’ rights. The party also introduced a separate clause guaranteeing full and equal participation of women in political life and public decision making. The NIWC also supported the creation of a Bill of Rights for Northern Ireland, a measure they continued to champion as elected officials in the Assembly. The NIWC’s commitment to inclusivity made them a unique actor who influenced not only the substance, but also procedural aspects that bolstered the success of the talks. Rather than adopt a strict platform, the party embraced three principals—inclusion, equality, and human rights. These principles served as a policy lens, and allowed for flexibility in approaching divisive political fissures. This contributed to the party’s reputation as an “honest broker,” and their ability to maintain contact with parties that, at various times, were excluded from the negotiating room after ceasefire breaches by their affiliated groups. By ensuring these parties were kept in the conversation, they reduced the likelihood of spoilers. In many ways, the party’s diverse membership—with representation from both political communities—led to stronger negotiating positions. The NIWC had to debate policies internally before they submitted a proposal, so by the time they returned to the talks, they could already anticipate and address potential objections. They adapted the concept of a “sufficiency of consensus,” previously used in the multi-party talks in South Africa, which helped the negotiators in Northern Ireland to take account of the plurality of interests at the table. Further, the NIWC took deliberate steps to build the capacity of its team, allowing members to backbench its negotiators to see the process up close. The visibility of its members inspired other parties to promote their own female members, leaving a lasting impact on Northern Irish politics even after the talks concluded. Reflecting on the Good Friday Talks twenty years later, the negotiations chair Senator George Mitchell concluded that the NIWC “played a hugely disproportionate role—disproportionate to their vote and to their numbers at the table—in the outcome.” It’s time to revisit the contributions women bring to the peace table. From Northern Ireland to Liberia to Colombia, women have been responsible for some of the most critical efforts toward lasting peace. The powerful new ‘Women, War and Peace II’ series offers a chance to look beyond the numbers and see the tangible ways in which women’s contributions have led to real change. When women are not written into the history books, their hard work, courage, and tactical ingenuity is forgotten, making it that much easier to dismiss women’s efforts today whether in Afghanistan, Yemen or Myanmar. Giving women a seat at the table is not only the right thing to do; women bring strategic vision and transformative perspectives that we can no longer afford to exclude.